There are so many features built into Squirrelcart that it is difficult to list them all on a single page. If you are looking for a particular feature,	and do not see it here, please contact us via email. Squirrelcart and Squirrelcart Pro have the same standard features; however, Squirrelcart Pro includes extra features provided by Pro modules that are normally sold separately. The list below is a very brief summary of our product and category features. You'll find more detailed information in the sections listed throughout this page. 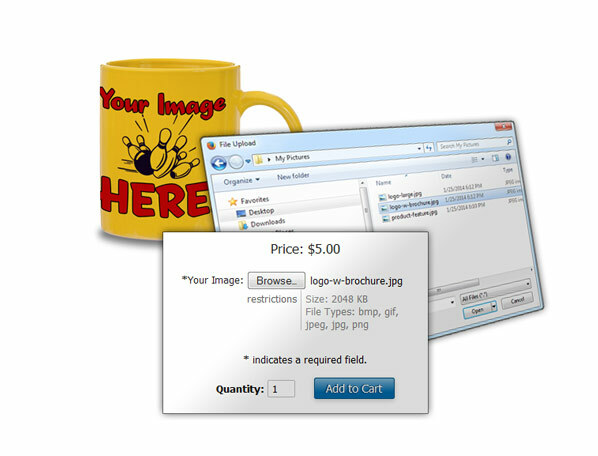 Products can be marked "not for sale", which keeps them in your database, but does not display them in your store. 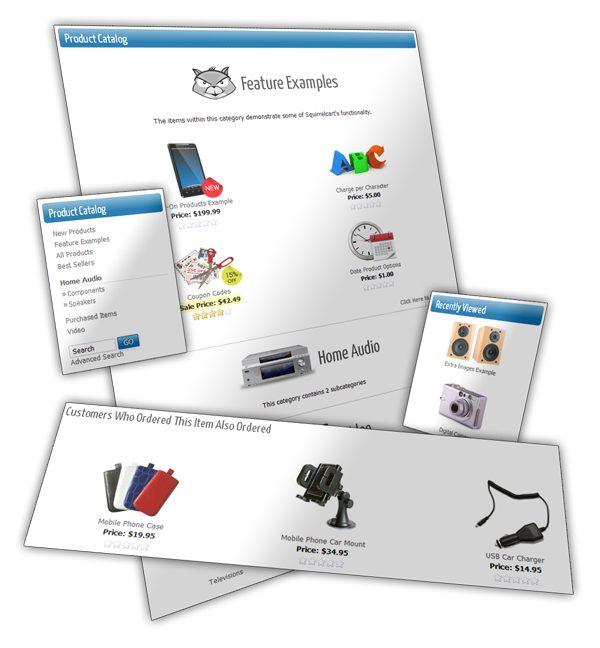 Advanced Image Features - auto-generate, resize, mirror, flip, rotate, and crop images. Control the number of products seen per row and per page, on a store-wide and per category basis. You can set a minimum or maximum quantity for individual products. Products can be sold in increments. 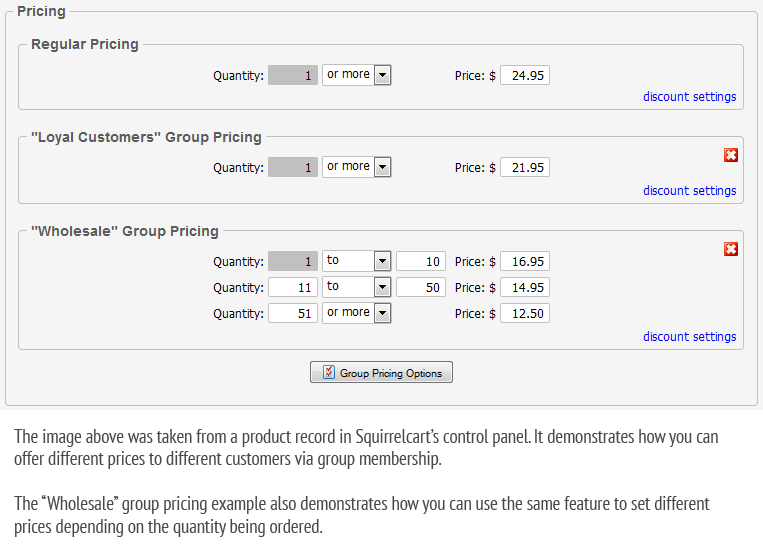 For example, if you have a product that must be bought in multiples of 6, Squirrelcart can enforce that for you. 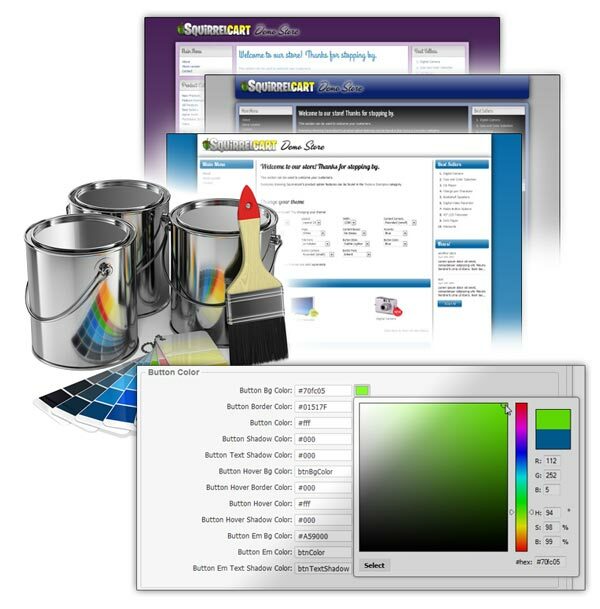 Flag your categories as "Brands" or "Manufacturers"
Squirrelcart can be extended by installing one or more add-on modules. All modules marked with * are included in Squirrelcart Pro	for one discounted price. They can also be added to the regular version of Squirrelcart by purchasing them separately. - Keep your customers notified via mailings and news posts on your website. - Organize and display photos via Squirrelcart's Photo Gallery module. - Lets your customers provide valuable feedback about your products, to help increase sales. 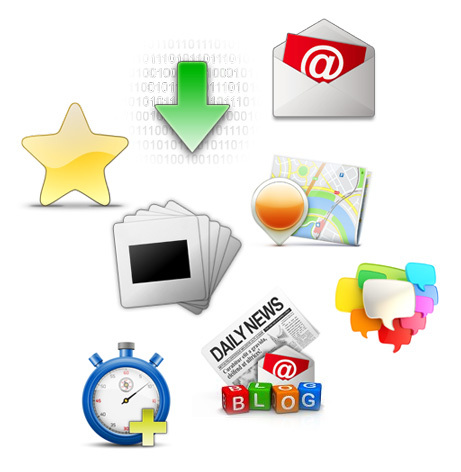 - Offer downloads to your customers while securing your files from unauthorized access. 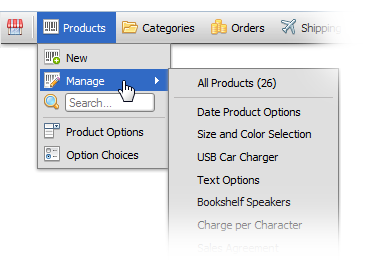 Automatic categories are special categories that display products without you having to add them to the category. 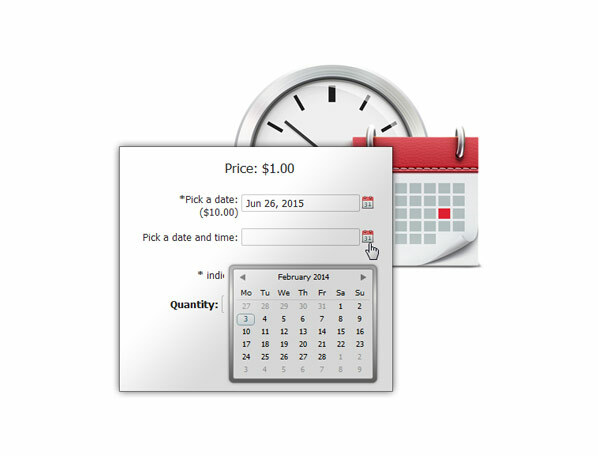 New Products - This category displays products considered new, using a setting equal to the number of days you specify. 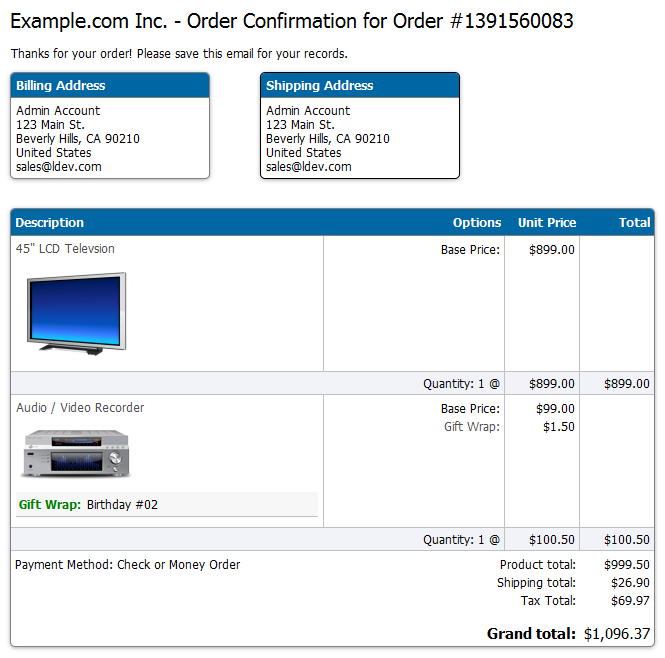 Purchased Items - This category displays all the items that your customer has ever purchased, for fast re-ordering. Control when and if customers have access to your store, categories, and products. You can also control what happens when they do not have access. This feature is great for sites that need to sell via wholesale, or for any other stores that require restrictions. For restricted products, you can either hide them, show them with no pricing, or show them with pricing but without access to purchase. 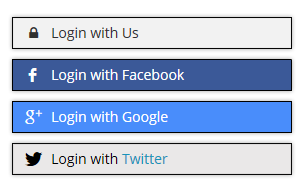 With our new social sign-in feature your customers can login using accounts they already have. They'll have one less username and password to remember, and will be able to login faster than ever, increasing the chance that they may order. 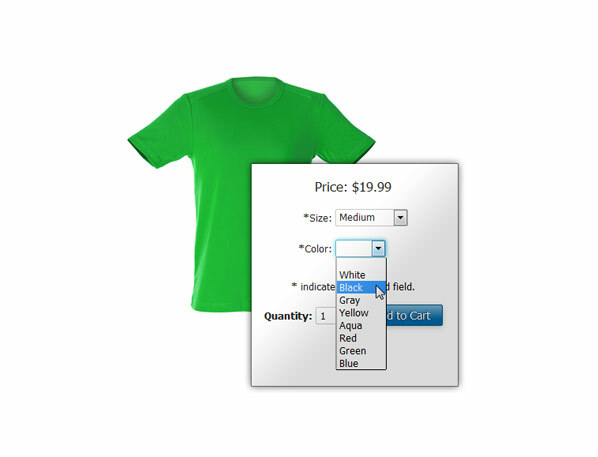 Product Options allow your customers to make choices when adding items to their cart. You don't need to know HTML in order to add form fields for gathering information from your customers, so they can choose options for products they wish to order. Squirrelcart will automatically generate the HTML needed for you, to show options using any standard HTML form field type, including: select, checkbox input, radio input, text input, textarea, and file input fields. - Click each slide for a live example product. can be used to gather a single line of text from your customer. 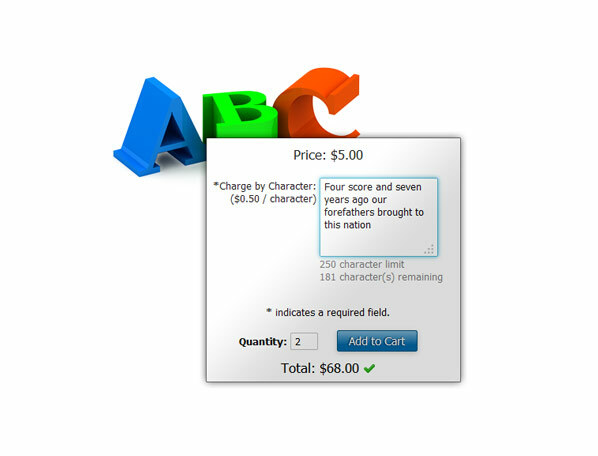 You can optionally set a maximum and minimum number of	characters allowed, and Squirrelcart will show the character count to your customers as they type! The cost of an option can be applied per unit (default), or per line item. 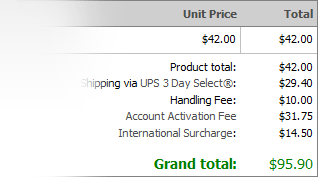 Charging per line item works great for setup fees, or anything that must be charged only once regardless of the quantity ordered. 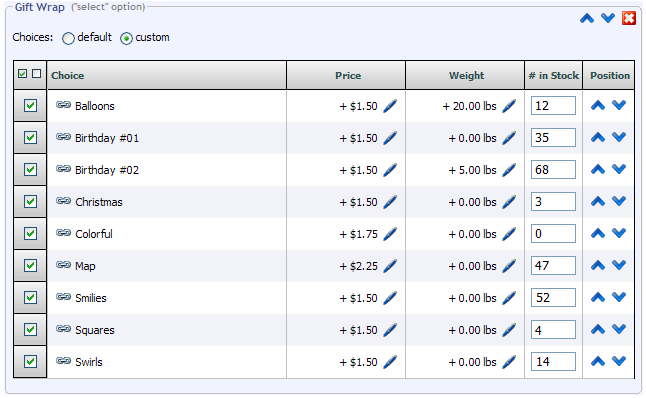 Options can alter the weight of a product (add or subtract), for use in real-time shipping rate calculations. 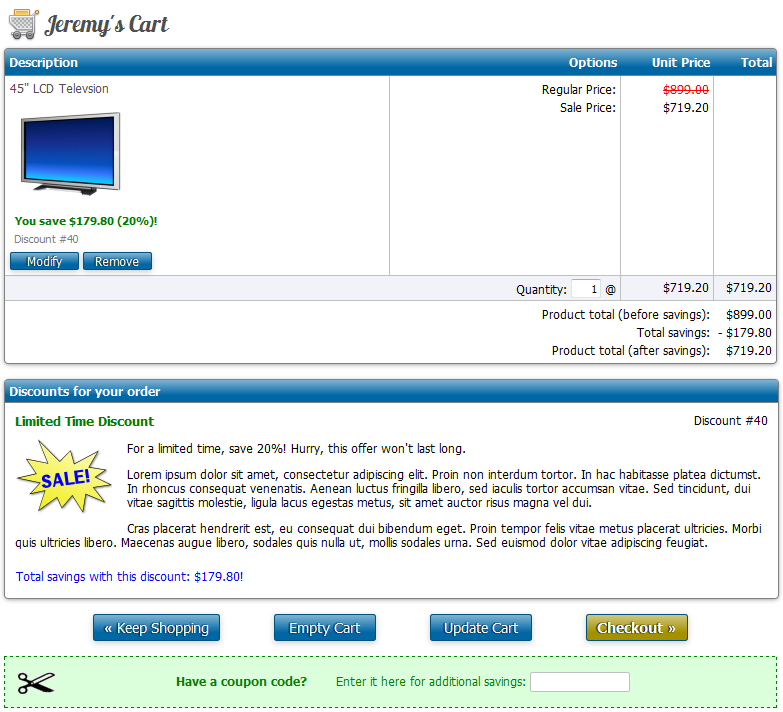 Squirrelcart can add a link that will open a popup detail page describing an option and its choices. If you add images for your choices, they will appear on this page. It's a great way to show detailed information describing the option and its choices. Our inventory control feature allows you to track your stock at the option level. Tooltips can be added to aid your customers in choosing options. 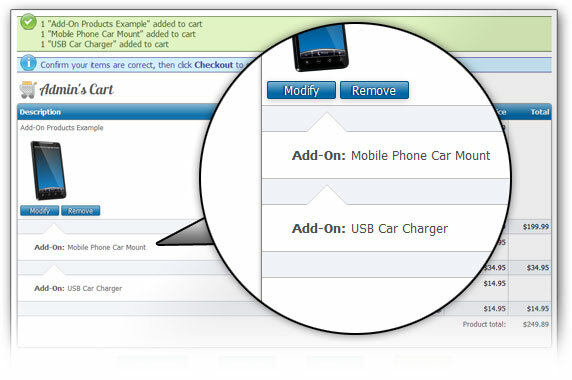 You can even make a product an option for another product, via our add-on products feature. This works great when you want to sell an item separately, and also as an add-on for another product. See the add-on products section on this page for more info. With the add-on products feature you can assign products to another product as "add-ons", using the related products feature. 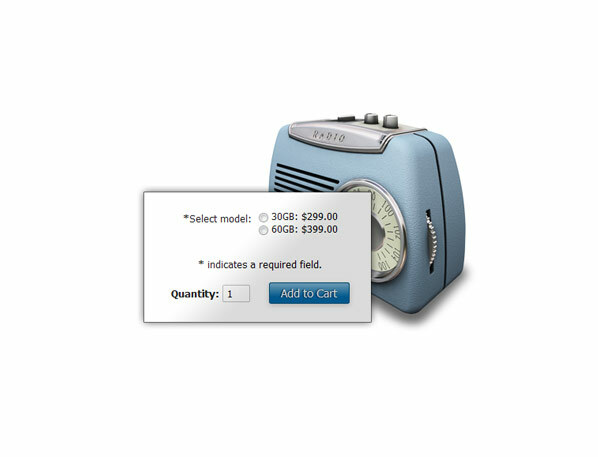 Improve your sales by letting your customers add an item and related items to the cart in a single operation. Add-ons are flagged as add-ons in all checkout and order views. When removing a product from the cart, add-ons are also removed. All the features that work with products also work with add-ons, including product options. 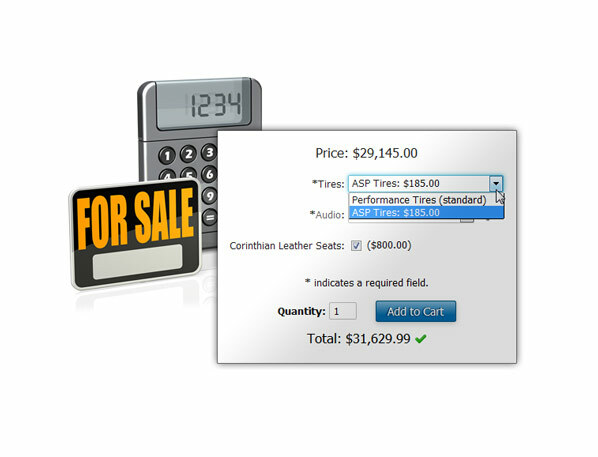 With the Quick Total module installed (sold separately), customers will see a grand total below the Add to Cart button, updated on the fly as add-ons are selected. Add-ons can have their own quantity field, or a checkbox to select them. Thumbnail images do not appear for add-on images during checkout by default (but can be enabled if desired). 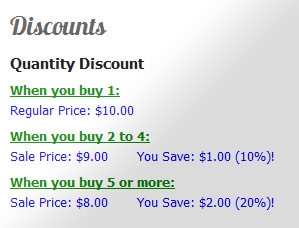 You can create just about any kind of discount you can imagine, using our discount features and our rule system. 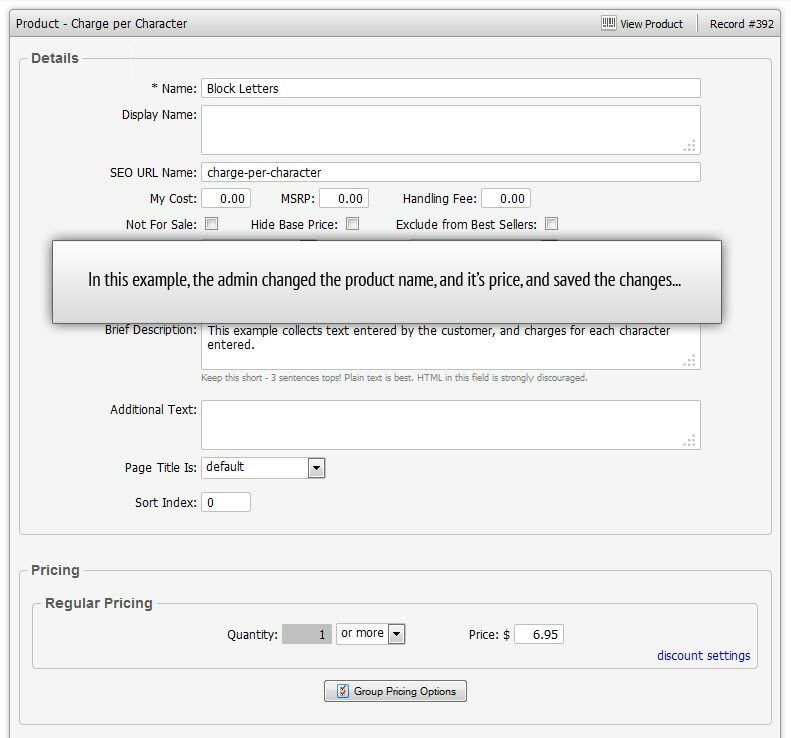 Create discounts at the product, category, or order level, using either set amounts, or percentages. With the quantity based discount feature, you can set pricing tiers for a product. This lets you offer better pricing when a customer orders in bulk. With the quantity based discount feature, you can also set different prices for different customers via group membership. This allows you to offer a product at different prices to different customers, and is great for wholesalers. Offer 20% off when coupon code 123ABC is entered, between May 1st and June 15th , when the user is in the "Special Customers" group, and they spent at least $500 in the past 180 days, and their last name ends in an "s", and their current order is over $250, and doesn't weigh more than 50 lbs. You would never need a discount like that, but it does demonstrate how much control you can have. Discount badges are images that are overlayed on top of your product images to indicate they are on sale. They can be shown on product thumbnails. They can also be shown when viewing a product's detail page. 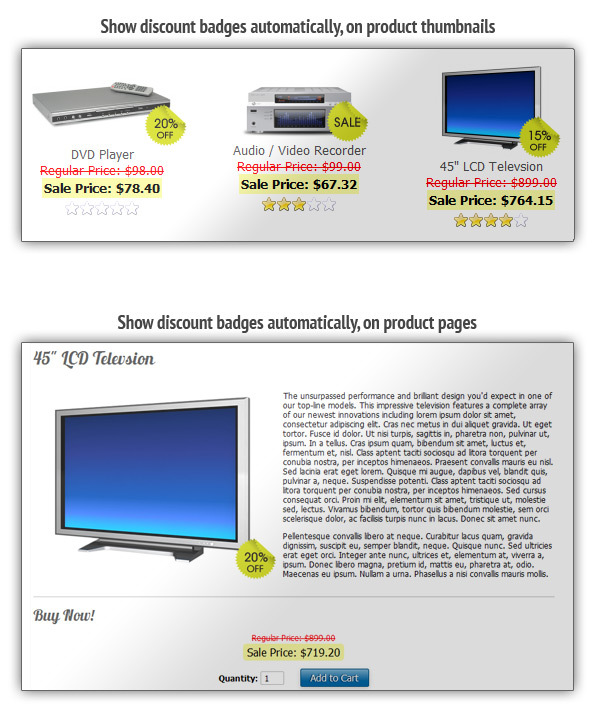 Advertise discounts on your product pages. 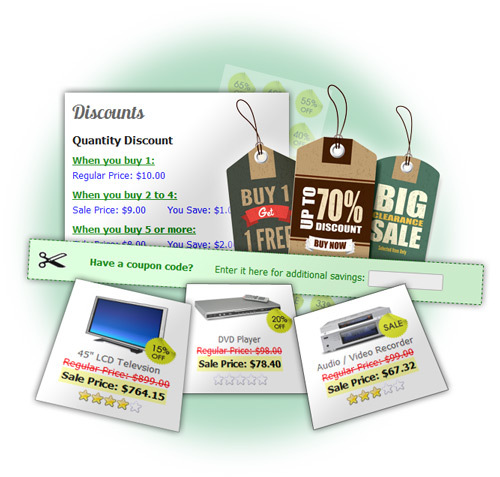 Many of our customers are SEO experts, using Squirrelcart for their e-commerce clients. Why? Because we understand the importance of SEO, and have added several features to help your pages rank well. You have full control over the page title, meta description, and meta keywords for all store pages, including: product, category, search, checkout, account, order history, content, module, and other pages. Squirrelcart automatically adds the correct metadata fields and tags to your pages, so search engines and other systems can understand them. Open Graph is an open protocol created by Facebook. It is a standard which allows you to add additional meta tags to a page to aid other systems in understanding that page. When Open Graph meta tags are present on a webpage and you share that page on Facebook, Facebook uses those tags to help determine how to handle that page. By adding Open Graph meta tags, Facebook can better handle your pages. While created and used primarily by Facebook, it is also used by other systems. Schema.org Microdata is an open standard similar to Open Graph. It is used by many search engines and other systems. This is Google's preferred means of specifying metadata. Using Schema.org Microdata on your pages will help Google and other sites better understand your pages. When enabled, Squirrelcart will automatically add the correct Schema.org Microdata to your pages, using a combination of <meta/> tags inside the <head/> tag of a page, and tag attributes throughout the page. With Twitter Cards, you can attach rich photos, videos and media experience to Tweets that drive traffic to your website. Simply add a few lines	of HTML to your webpage, and users who Tweet links to your content will have a "Card" added to the Tweet that's visible to all of their followers. Twitter Cards work much like Open Graph, via special <meta/> tags. Query strings in URLs are difficult to read, have no meaningful words or phrases, and don't help you understand the page being linked to. The words used in the URLs can be customized. We call these bases. By default, the bases are generated automatically based on your products, categories, and other records, however, they can be customized to suit your needs. This may cause search engines to treat those page variants as duplicate content. To prevent this, Squirrelcart automatically sets a canonical <link/> tag on these pages, pointing to the correct master URL for these variant URLs. When viewing a category or when viewing search results, if more products are available than will fit on a page,	that page may contain page navigation links to navigate to other pages in the data set. Squirrelcart keeps track of every value you specified as a base for your products, categories, and other content. When you specify a new base, the old base	is stored in a log. If the page is requested using the old URL via a bookmark or a link in a search engine, Squirrelcart will automatically issue	a 301 redirect to the new URL. This helps humans get to the correct page, and also lets search engines know that the page has moved. There are too many features in the storefront to list them all here. However, this is a small subset of some of the components you'll find in the default storefront page. You can create your own navigation blocks and content to add any additional HTML you like. 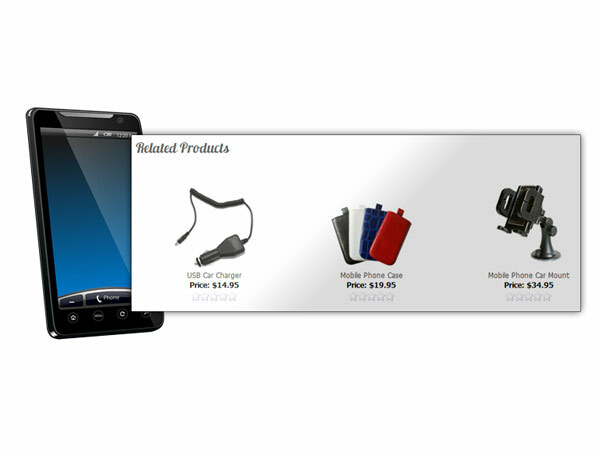 Product Catalog navigation block - displays categories for browsing. Account Options navigation block - when logged in, displays options for the customer. When logged out, displays the login form. User accounts can be configured so they are required, optional, or not present at all. 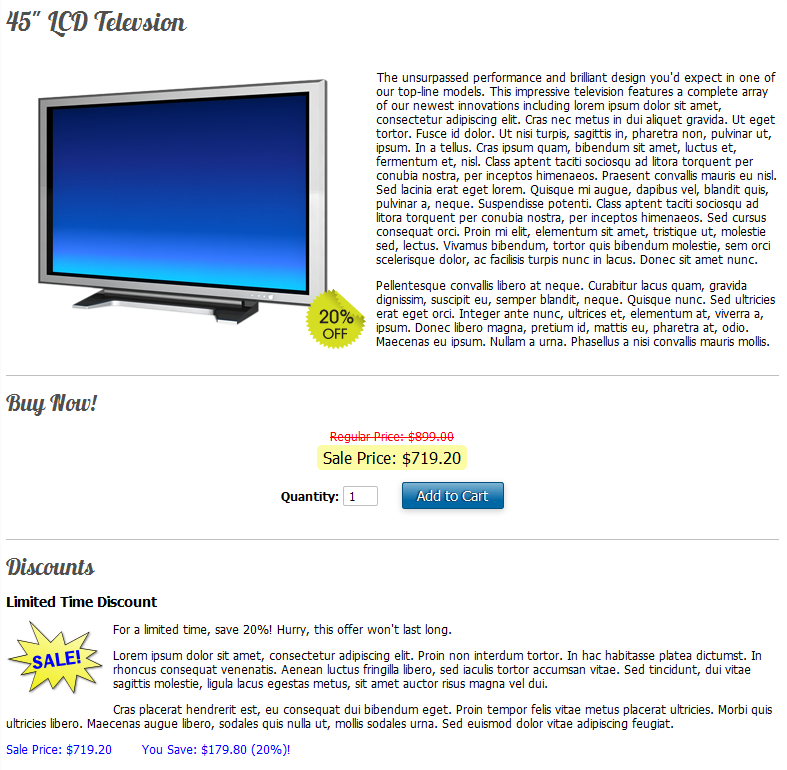 Category Preview navigation block - this is shown when you are viewing a product. It is a preview of other items in the category you currently are viewing. In the example, the category preview is seen on the right hand side of the page. 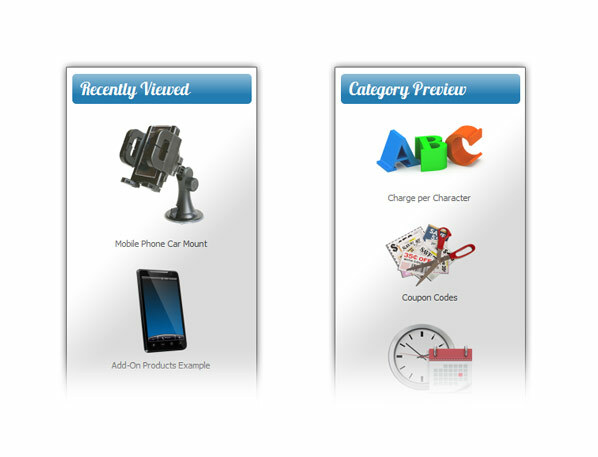 Recently Viewed navigation block - this shows products the customer has recently looked at, in the order viewed. This gives them a way to easily return to a product they were interested in. 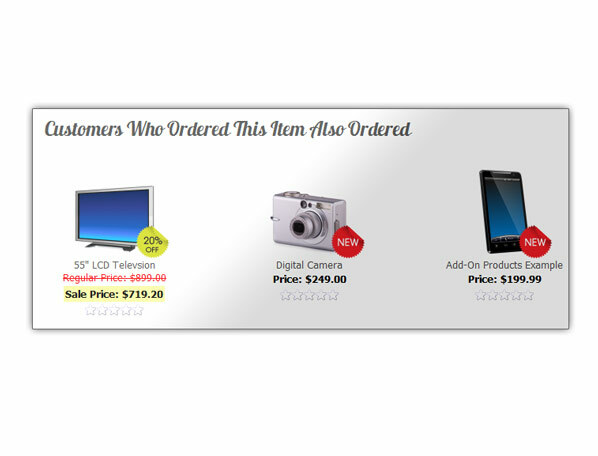 "Also Ordered" Products - When viewing a product, this displays other products that were ordered with that product by other customers. 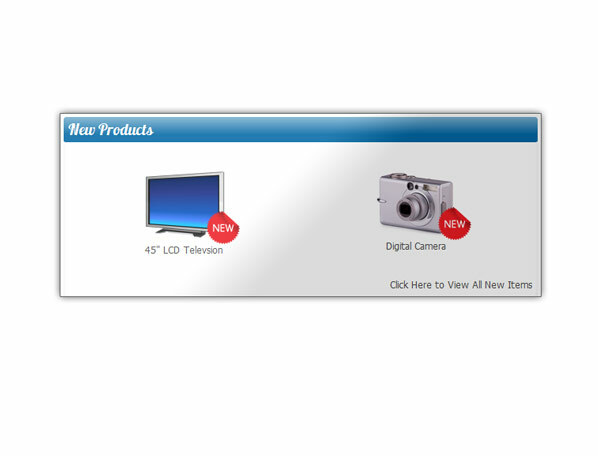 Related Products - When viewing a product, this displays related products that you define in the control panel. Squirrelcart can track the number of units you have in stock, for both products and product options. Don't sell more than you have in stock! Without inventory control, it is very possible that two customers could order the last of an item in stock. You would be left issuing a refund to an unhappy customer. Our inventory control feature makes that a thing of the past. When an item is out of stock, you can set a store-wide out of stock message. If you want to get more specific, you can specify custom out of stock messages for individual items. This can be used to let the customer know when an item	will be back in stock. 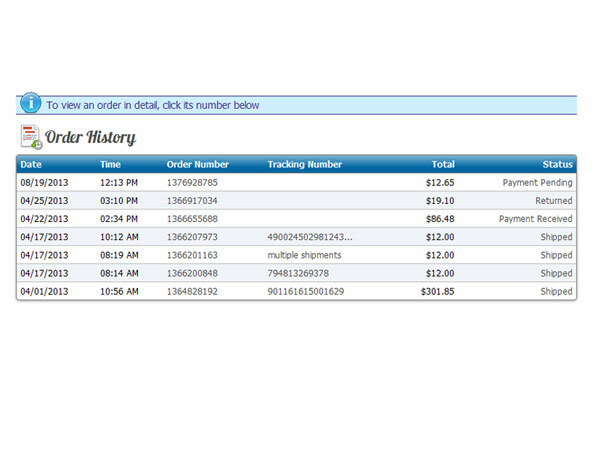 Squirrelcart can restock when you issue a refund, delete an order, or assign a custom order status. Squirrelcart stores information via MySQL, the world's most popular open source database. Customers, products, categories, store settings, shipping options, payment methods, and orders are all stored in the database, for fast and efficient access. With the backup tool in the control panel, you can create database backups, and restore using them should things go awry. 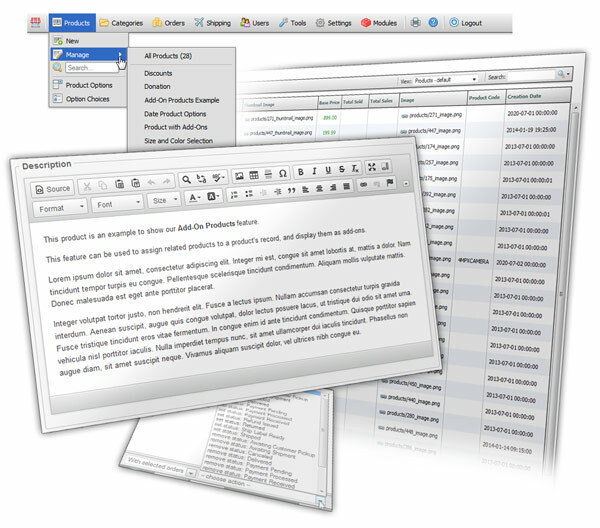 Export data from any control panel table view, in comma separated (.csv), Microsoft Excel 2007+ (.xlsx), or Microsoft Excel 2003-2007 (.xls) format. With the query tool, you can perform direct database queries against your database. When doing this, be sure to create a backup using the backup tool first. Squirrelcart can send several different emails, all of which can be turned on and off, and can be customized using our control panel and template files. Refund notification, to let a customer know they have received a refund. Send notes to customer regarding their order. Squirrelcart can send emails using SMTP (with or without authentication),	PHP's built-in mail() function, or sendmail. With our automatic email feature, you can set up custom personalized automatic emails that can be sent to users and to staff when certain events occur. You can automatically send emails when an order is placed or updated with a status, and when a user is created or added to a group. With our rule system, you can further refine when an email is sent. It is possible to send an automatic email for just about any scenario you can come up with. When a custom item is ordered, telling the customer how long it will take to process. When a customer reaches a spending total of $500, offering the customer a special discount. When an order is placed between December 25th and January 1st, letting the customer know that there may be a longer wait time for delivery. When you've added a customer to a Wholesale group, notifying them that they have been granted special pricing. When a customer has opted into a news group (requires News module), confirming with the customer that they have joined the group, and thanking them for joining. If a user orders an item that has a file upload option, you can receive those files as	attachments to the order notification email. 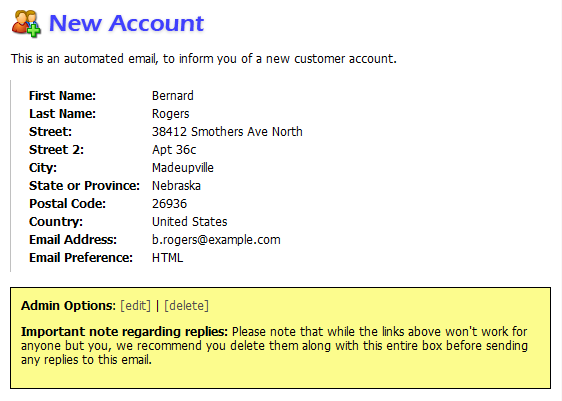 Send account reset emails to users that have lost their username or password, via a record action in the control panel. Users can specify whether they prefer to receive HTML formatted or plain text formatted emails. This feature can be turned off at your discretion. We have built-in support for all couriers, with powerful tools like real-time rate lookups, tracking, shipping label creation, address validation, and more. Squirrelcart is partnered with Endicia.com to give you full access to generate USPS prepaid shipping labels, along with access to many shipping tools to aid	yourself and your customers. Customers can get live USPS rates without leaving your website. Tracking support allows you and your customers to track shipments without leaving your website. Address validation can be used to correct addresses during checkout, and when generating shipping labels. 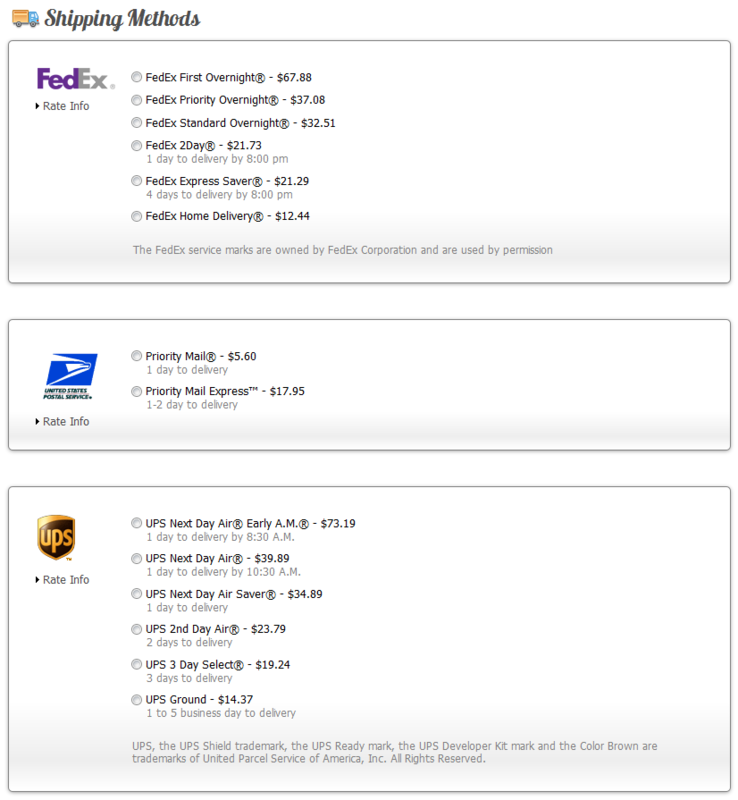 Customers can get live USPS rates from USPS.com without leaving your website. Squirrelcart is certified to work with FedEx® Web Services, via the FedEx® Compatible Solutions Program. We are a UPS Developer Kit Approved Provider. Read about our UPS Developer Kit integration. 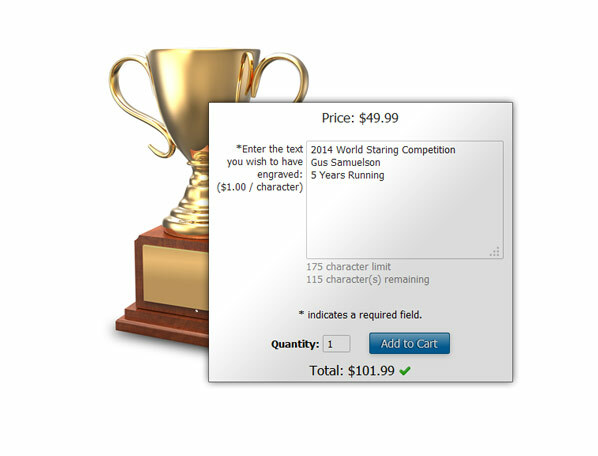 Ability to create custom shipping rules to offer whatever rates you like using our powerful rule system. Offer rates based on order weight, cost, number of items, address, and much more. Full support for changing weight and dimension units, with feature to convert all weight/dimension field values from inches to centimeters, pounds to kilograms, and vice versa. Automatically create shipping labels behind the scenes, the moment your customer submits their order (for UPS and FedEx). 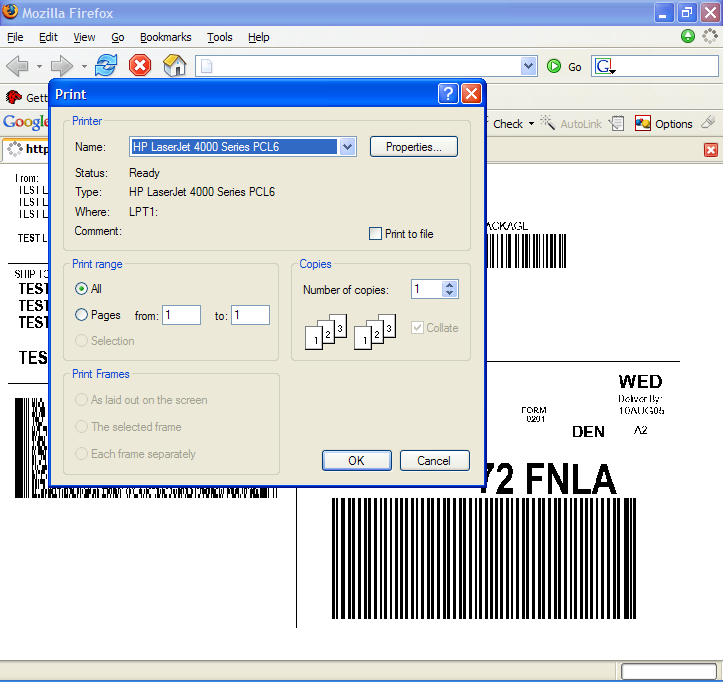 Automatically print thermal labels that were created during checkout, to an IP based thermal printer. This will result in the label being printed the instant the customer completes their order! Assign an unlimited number of additional fees to your orders. With our powerful rule system, rules can be assigned to control when a fee is charged. You can add fees based on location, past orders, group membership, date, and much more. Fees can be shown as "handling", or given any custom label you specify. With the cart persistence feature, your customers can keep items in their cart for days, weeks, months, or as long as you like. Carts are stored in the database for safe keeping, preventing lost sales, and making all sorts of nifty things possible. Add items to the cart, close their browser, and complete their order later, even if they are not logged in. Upon return, their cart will be just as they left it. Login, start an order, and finish it on a different computer at a later time. After logging in (from any computer), their cart will be just as they left it. Carts survive, even if the user's session does not. This means a cart can persist even after a power loss or a server reboot. See details for carts, even if they did not make it through to completion. Change a cart into a completed order, in the event that the user did not finish the order themselves. This can be especially useful should a	payment gateway fail to notify Squirrelcart of payment. Delete carts if they look suspicious, silently emptying the customer's cart. View both active and inactive carts in the control panel. Carts can be deactived or deleted, using timeframes set in your control panel. The items in deactivated carts get restocked automatically, but they stay available for the user should they return. 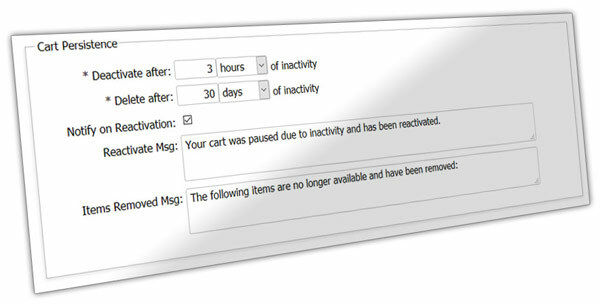 If a user has an inactive cart and returns, their cart will automatically be reactivated. Upon reactivation, Squirrelcart checks to make sure the items are still available, and updates prices if they've changed. Squirrelcart can handle the following types of payment. If you are going to take credit cards for payment, you will need to use a payment gateway or payment processor. Squirrelcart supports most popular payment systems. Create tax exempt groups, for wholesale or non-profit customers. VAT support for all 28 EU member states. Support for VAT exemption - to allow exempt companies to not be charged VAT by entering their company name and VAT registration number at checkout. 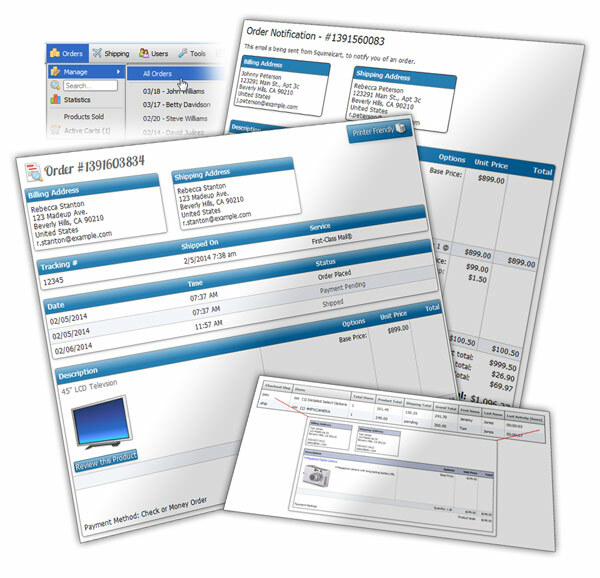 After an order is placed, Squirrelcart can help you fulfill and manage it with our order management features. You will receive orders in your inbox, in HTML or plain text format. They look just like they appeared to the customer when they placed the order. Orders can also be viewed in the control panel. 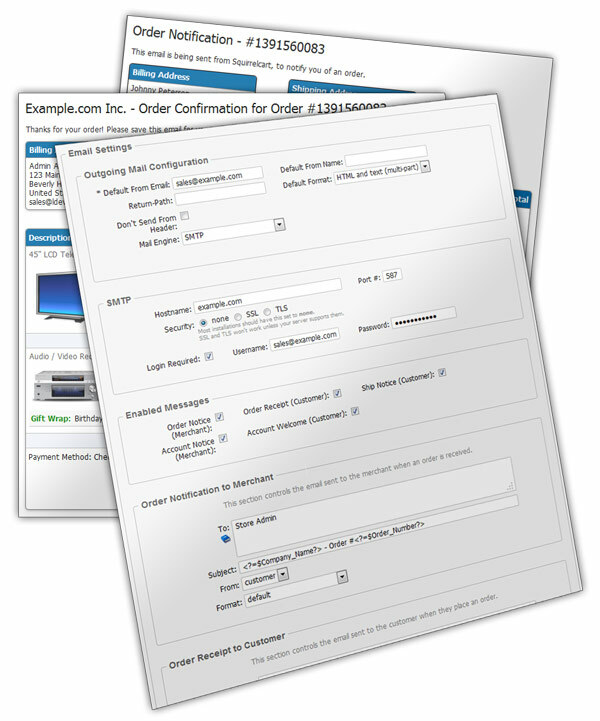 Select multiple orders, and print them all in one shot to save some serious time. You can track the state of an order using our order status feature. It allows you to assign a status to an order which is marked with a timestamp. 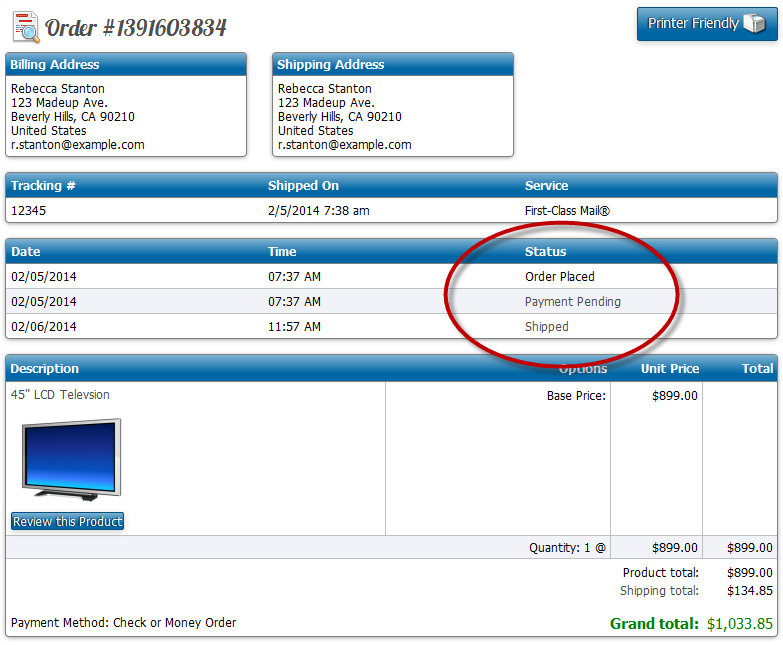 The status indicates where the order is in your fulfillment process at any given time. We have several built-in order statuses, such as payment pending, payment received, approved, shipped, refunded, etc...	You can also create your own custom order statuses to suit your specific business needs. 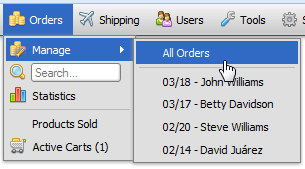 You can edit orders in the control panel, to adjust address information and totals. Assigning a status of shipped will automatically trigger a shipment notification email back to the customer, with a tracking number if one is available. 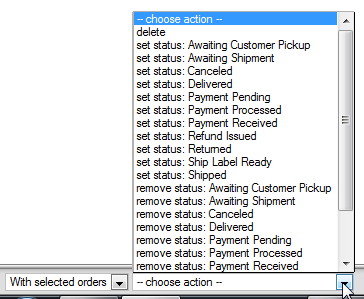 Customers can see the status history of their orders on their order history page. If you have an order status that is for internal use only, you can hide it from your customers. 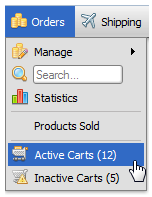 With our active carts feature, you can see live orders as they are being placed, just as the customer sees them. Our order statistics page shows a breakdown of sales (along with shipping, tax, handling, etc...) for each day of the month, the last twelve months, prior years, and for the current month across all years. You can drill down by clicking on a year, month, or day, to drill down to the next level. You can even see a breakdown of orders by hour for any given day. When you want to work with stats offline, you can export them to .CSV or .XLS files. 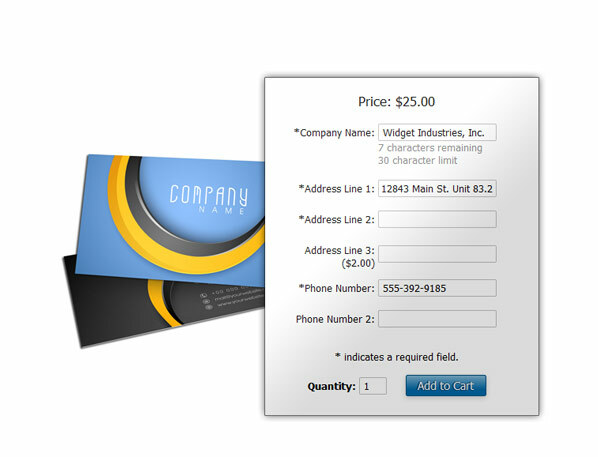 Agreements can be shown at checkout, on the account form, address form, and product pages. Sales agreements assigned to products will appear on the payment page OR on the product page, depending on your configuration. By default, customers must indicate that they agree by checking a checkbox. You have the option of making agreements informational only, which will remove the checkbox. Information the cart needs in order to maintain the flow of the application is temporarily stored on the web server using sessions. That information is not stored in cookies. Passwords are stored as one way hashes. The hashes are created using the Blowfish algorithm (by default, if available). We take security very seriously, and always write code with security in mind. Squirrelcart passes all PCI scans. Any vulnerabilities that may arise in Squirrelcart are patched as quickly as possible (usually the same day they are reported to us). If you suspect that a problem in Squirrelcart may have been used to cause a problem on your site, or to gain unauthorized access, notify our support department as soon as possible and we will help. All security patches are available on our Downloads page to all users regardless of their download status. They are located in the section labeled Security Patches. 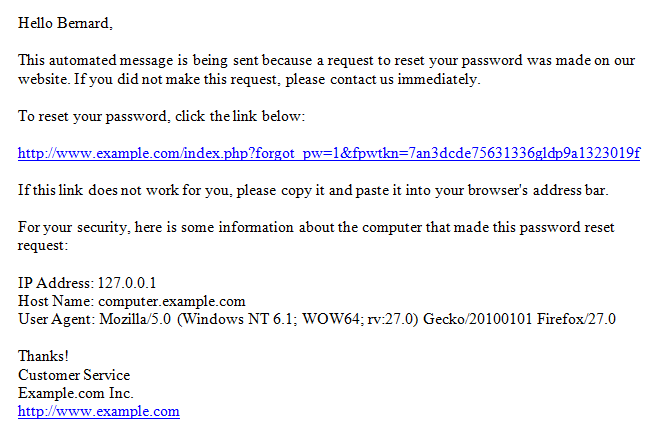 We offer a security mailing list that you can join to receive important security announcements. On the server-side, Squirrelcart is written using PHP. Our PHP code is neatly organized, commented, and not encrypted. If you are a PHP developer, you have access	to the actual source code, which you can modify to suit your needs. Please keep in mind that we only technically provide support for modifications to template files,	though you have the freedom to change whatever you like. We use MySQL for our database engine. Having valid HTML and CSS is important. It helps ensure cross browser compatibility, reduces layout issues that may be due to mistakes, and	ensures your content can properly be crawled and indexed by search engines. If validation is important to you, you can't have valid code if you start out with a cart that doesn't validate! 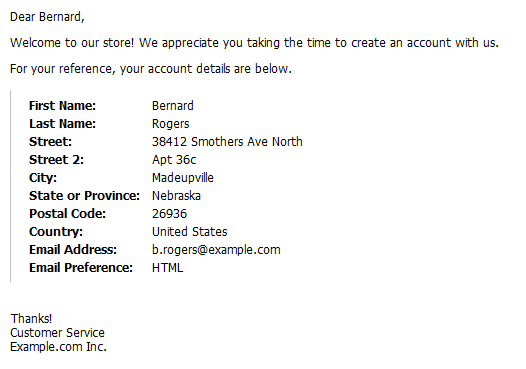 Our HTML validates as HTML 5 transitional. Our stylesheets validate as CSS 3. We make proper use of browser caching, compression, and file size optimization to speed up page loads. 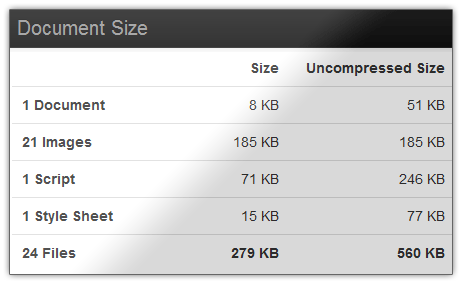 Here's the total request size for the homepage of our demo store (as of this writing). 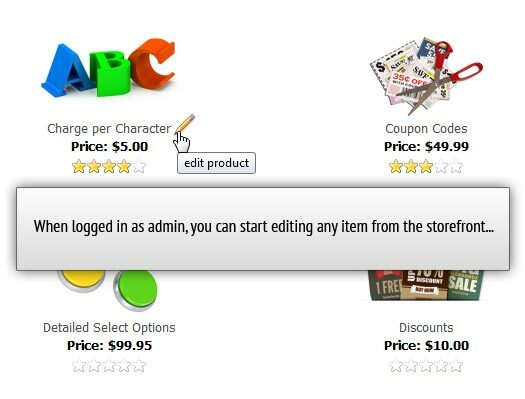 Squirrelcart's back end administration section has been designed for ease of use. We've spent countless hours making it as simple and intuitive as possible. 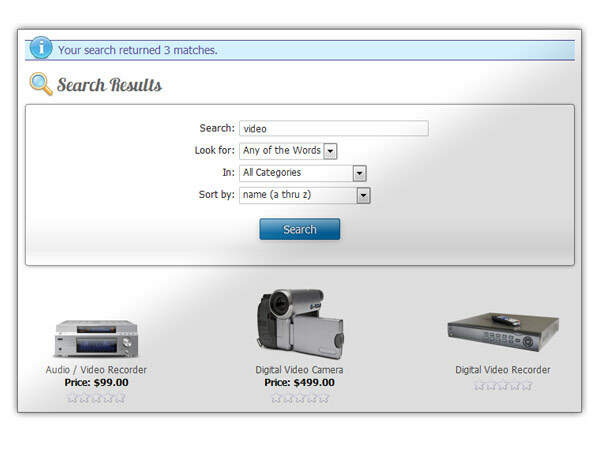 You can search from directly within the menu, for products, categories, orders, and users. Quickly access the most recently edited products, categories, orders, and other records directly from the menu. If you are logged in as admin and want to edit a product, category, or other record, you will see an edit link near the item in the storefront. Clicking the link will take you right to that record in the control panel. On save, you are returned back to the store. This makes it very quick and easy to make changes. 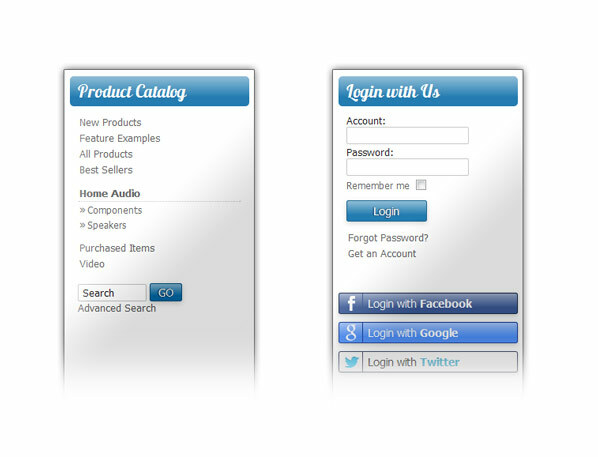 Products, categories, and other items in the store are edited using forms in the control panel. Most field names are self-explanatory. For a field that might need some explanation, you can hover over the label to get instant help. Squirrelcart includes a rich text editor, to edit fields that accept HTML. 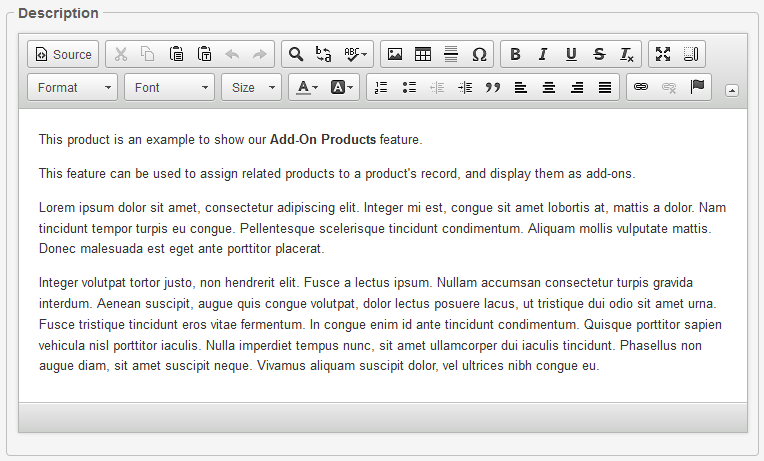 With the editor in design view, you can create HTML for use in the store without having to be a web developer. Use the editor to change fonts and colors, add links, images, bullets, check spelling, etc.. If you have HTML skills, put the editor in code view and you can work with the HTML directly. With our record actions feature, you can perform actions on multiple records with a single operation. Order and customer records in the control panel include a map showing the location of your customers, via Google maps. Squirrelcart is not just a shopping cart, it is also a content management system. You can use it to run your entire website, or just your store. Squirrelcart creates your product, category, and checkout pages for you. With our CMS features, you can create other pages as well, and edit them in our control panel. You can create additional pages like About Us, FAQ, Privacy, or any other pages you might need. Our content records use the same rich text editor found on your product records, making it easy to write HTML without having to be a web designer. With the same feature, you can add your own custom content to your store home page, edit it, and control where it appears. With the same feature, you can add your own custom nav blocks to the store, edit them, and control when and where they appear. With our links feature, you can manage your links, organize them for display in certain areas of your store, link to external pages, and more. 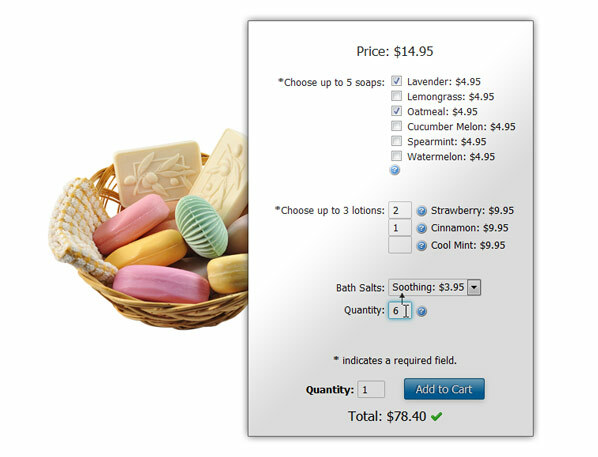 Squirrelcart uses themes to control the appearance of the store. 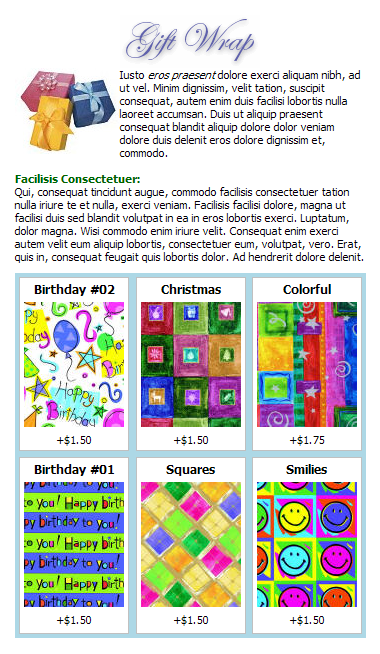 Themes contain individual templates, stylesheets, and images that define the appearance of your store. By changing your theme or its settings, you can completely change the way your store looks. 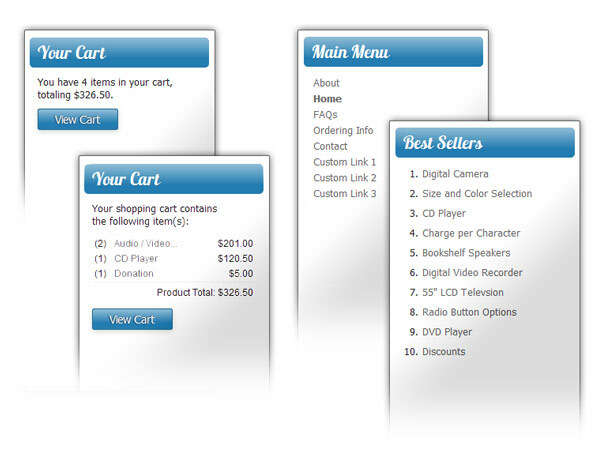 Squirrelcart comes with a built-in theme that gives you incredible control. We've added support for 10 different layout styles in four different widths, complete control	over colors, shadows, borders, corners (square, rounded), CSS3 linear gradients, CSS buttons without images, support for web fonts via @font-face declarations, and all sorts of other stuff. If you are a web designer, you have full control over the design. Squirrelcart can be made to match any design you can come up with. Our template files are PHP files, containing mostly HTML with some PHP mixed in. You don't need to know PHP to customize our template files.